Overview: SetCPU is a tool for changing the CPU settings (capable of overclock and underclock) on a rooted Motorola Droid, Nexus One, G1, G2, Samsung Galaxy S, myTouch 4G, or one of many other devices to improve performance or save battery. 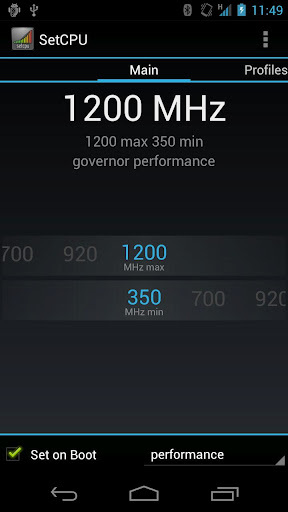 SetCPU is a tool for changing the CPU settings (capable of overclock and underclock) on a rooted Motorola Droid, Nexus One, G1, G2, Samsung Galaxy S, myTouch 4G, Motorola Xoom, or one of many other devices to improve performance or save battery. SetCPU also allows you to set up powerful profiles to change the CPU speed under certain conditions, such as when the phone is asleep or charging, when the battery level drops below a certain point, when the phone's temperature is too high, or during certain times of day. See the screenshots for examples of how you might set up profiles. SetCPU's wide feature set make it useful to beginners and enthusiasts alike. Accelerate your processor to unleash your phone's multitasking potential, or dial your CPU's speed down to save battery. SetCPU also includes a "voltage control" menu, for use with certain devices with custom kernels that support it, to control undervolting to save even more battery. Keep in mind that undervolting is only available for certain kernels. Have an HTC Sense device with a stock ROM or kernel? If you are having trouble getting your settings to "stick," press Menu > Disable Perflock. You still have to be rooted. Galaxy S devices: conservative scaling is recommended where it is used by default (ondemand on the Nexus S and Galaxy S II). There are issues with Galaxy S kernels that may result in crashes if some other scaling governors are used, or if the sleep profile "max" value is set too low. 2.3.0.1: Fixed a major issue with custom frequencies. Sorry about that! 2.3.0: All new interface featuring a new frequency slider. Tap or slide your finger across the slider to quickly switch CPU speeds. Added an Action Bar and implemented View Pager navigation, revamping the entire interface around the new Android design guidelines. Dropped the dual pane info menu and added simpler Action Bar-based navigation. Changed all references to "scaling" to "governor." Added a new governor menu (previously "Advanced") that supports more governors and supports persisting when switching profiles. Improved support for some multicore systems and tablets. Dropped support for Android SDK versions Android 2.1 and below. Removed jargon from some descriptions and explanations. Numerous minor bug fixes and interface enhancements. Perflock disabler update coming soon. 0 Komentar untuk "SetCPU for Root Users v2.3.0.1 Apk"